After hearing many of my friend's personal experiences with the use of Ouija boards I became curious of the powers this type of board supposedly commands. I decided to go out and purchase one at a local "Toys 'R' Us", which I thought was funny to begin with. After purchasing the game I recruited a few of my friends into playing which was difficult at first since many of my friends either have played it before and had negative experiences or felt uncomfortable trying to communicate with spirits in the first place. I eventually got a few of my friends to join me and with them they brought a few more. There were about ten of us that ended up playing. After stopping for candles, which a friend told me to use during the experience, we finally ended up under a gazebo in a nearby cemetery. I chose a cemetery because no one wanted to play at their homes and a cemetery felt like a cool location to call out for spirits. As the game went on only four of us partook while the other six became spectators only. A few questions were asked and the planchette began to move more and more. Nothing about the board made me think it was real until we asked the question, "What is the name of our friend who recently died?". Three of us were on the board, one being a good friend of our deceased friend, the other was a girl that wasn't from the area and did not know him. 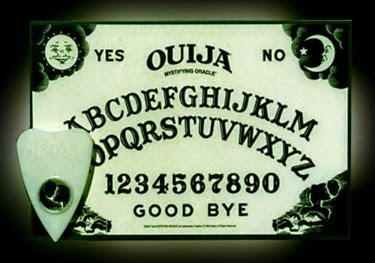 After asking the "spirit" that we've been communicating with this question the planchette began to move again. My friend and I witnessed the piece of plastic move over the "r", we then agreed to look at each other and not the board. The plastic kept moving and the next letter "i" was revealed, followed by "c", and at last an "h". Spelling out "rich" which was our friend's name freaked the majority of people out to the point where seven of them left. That part gave me a chill but I was still interested in continuing the game. Shortly after deciding to stay is when everything for me changed. Two friends remain as well as myself as we try ask new questions. Before getting to that point however we heard a very unusual sound coming from the graveyard. As we looked in the distance we saw one of our friends walking across the graves. He originally came with us and had no ride with the ones that left due to lack of seats apparently. He's walking aimlessly like a zombie and eventually comes toward the gazebo. He stopped about twenty feet or so from the gazebo and dropped like a ton of bricks. The three of us were curious of why he was just laying there so my one friend decided to walk over to him. I had my phone out to take a picture of him because I thought it was funny how he was just planted on the grass. For some reason my camera on my phone would not take the picture and it kept saying camera failed. I never experienced this happen so I tried two more times both with the same result. Out of nowhere my friend who just had fallen somehow jumped up on his feet faster then I've ever seen. I decided to walk over to the two of them after seeing fear and panic in my one friend's eyes. I walked over to see my one friend quivering and as I looked at the other chills started to run through my body as I see his eyes and there pitch black. I have never seen as evil as a look in another's eyes as I saw that night. He started walking over to my friend slowly looking like he was going to kill him. I had my friend walk back to the gazebo and I grabbed the other and walked him down the pavement. He started to talk and out of nowhere his eyes went back to normal size and of normal color. After this incident we decided to leave so we decided to go back to one of my friend's houses that was with us earlier. We told our story which had everyone uneasy. The three of us who were involved in the situation decided to stop off at the lake to talk about everything that just occurred before calling it night. As I explained what happened to my one "possessed" friend we'll call him, he is confused and in disbelief. I explained how my phone would not take a picture as I tried photographing him. I start taking random shots of the lake and they come out fine. As the discussion continued, fifteen minutes later and I was at this point a spectator to their conversation. As I was listening, a weird feeling came over me when I looked at my friend whom was originally scared with me. His face looked serious then when turned to a side profile looked almost like a grin. It was sinister and made me feel uneasy. I decided to take my phone out and nonchalantly take a photograph of my friend who I'm getting such bad feelings from. My camera failed and soon there after it ended my night. I was left fearful and paranoid and nothing for a couple nights can shake the feeling. After seeing all of this I decided to think about all details of that night and I remembered the friend who freaked me out late that night disappearing for a few minutes during the game. I didn't think anything of it at the time but a day after I thought it was strange due to my friend being afraid of his own shadow. I decided to ask him about that and he told me something was drawing him to this old abandoned white house at the edge of the cemetery. He continued to tell me that after going over by the house he felt he was being watched. He turned his back and saw a black shadowy figure hovering across the graveyard in the distance before disappearing. He returned to us and mentioned nothing of this that night. This is only the short version of my story but this night had left me shaken and gives me chills every time I bring it up. I decided to use the Ouija board on three other occasions and had no results from it. Was it just our imaginations running wild that caused all of this or could have it been something real like the shadowy figure my friend swore he saw? Logic tells me that it was nothing paranormal and it was all an illusion, but even if it was, that feeling of fear and evil presence will stay attached to me for all time. First off, wow that story is pretty insane. I got some chills just reading it and I could only imagine how odd and fearful it must have been actually experiencing it. I too have had an experience with an Ouija Board, definitely not one as serious as yours however. Instead of writing a long comment, I'll give you the quick short story. After work one night I went by my friends house where I found him and a few other friends of mine all hovering around the board. They tried to explain to me how they too had contacted a friend of ours who had passed away about a month earlier, but I wasn't buying it. As I sat down and spectated, I noticed the questions they asked were ones with very easily answered answers, something anyone of them could have known. So I believed that it was just my friends being stupid and moving the planchette themselves. It wasn't until my deceased friend's girlfriend came over till I started to really believe in what we were doing. By this point I had stop spectating and was actually participating, myself and another friend of mine who had not been playing and like me doubted what was actually happening, were the only two holding the planchette. His girlfriend starting asking really personal questions that they would only know between each other and sure enough the board answered correctly. I will never forget actually feeling that little piece of plastic move underneath my hands, really one of the craziest experiences I have ever had.